music | The Book Cafe! I am slowly starting to read some Murakami. The first book of his that I read was Strange Library which was indeed strange and had such a beautiful cover featuring a library card! Next I read Desire, part of the Vintage Mini Series, which had five of his short stories. I absolutely adored that book! Read my review here! The Book Cafe is proud to present a new series that will highlight the books that have a musical element in them! The books could be about music, or have protagonists that love music or have some great music references or some other elements that make the book/story connected to some form of music! Take a look at all the entries in this category! Spread the music: Share and spread the word! Oh we love guest posts! 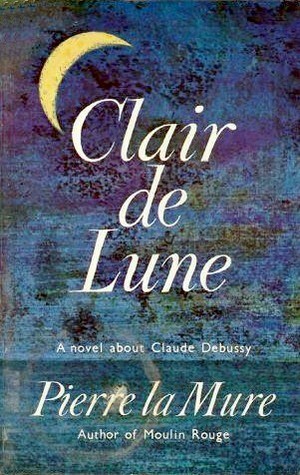 Perhaps you know about books that are related to music? We would love to hear from you! Read Persepolis by Marjane Satrapi? How about picking up another of her equally insightful and somberly black and white illustrated graphic novel, called, Chicken with Plums? The musician Nasser Ali Khan’s favourite tar (an Iranian percussion instrument) is broken. He probably had the best one in the world. Now that it is broken, he goes on a search for an equally matched tar. But after failing to find such a one despite his repeated attempts, he consigns himself to a state where he simply only wishes to die. The protagonist being a renowned musician having deep questions about his art and his life makes this novel part of The Book Cafe’s series called, Musically Yours! Which is why when it is intertwined with the written word, music helps to express what alone words could not. Music dripping with the heartache of a rash mistake in love,music bubbling with pure passion and reaching ethereal heights. All this and more defines Vikram Seth’s novel, ‘ An Equal Music.’ It is steeped with Seth’s intense love for music and his love for literature. Both these loves merged splendidly together make this musical novel a beautiful love story of love lost and found and ephemerally cherished. 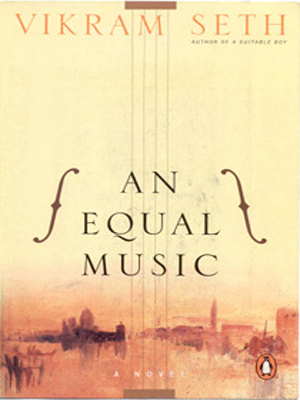 Though, ‘An Equal Music‘ is a masterful book,the plot is quite conventional. A violinist in his 30s named Michael is part of a string quartet, Maggiore Quartet. He lives in London and one day he accidentally sees Julie,the girl he loved 10 years ago and whom he left back in the days when they were music students in Vienna. This coincidence raises Michael’s hopes for reigniting their love and a string of events-Julie coming to meet Michael after one of his concert performances,she dropping in his apartment, their walks in the park-do just that(much to Michael’s pleasure). However, ten years is too big a gap to fill out by mere walking in the park.There are several changes in their lives that constantly keep altering the love affair they both find themselves in. These anecdotes of love are suffused with fine touches of soft musical notes,fugues and pieces of great musicians like Mozart, Schubert,Bach etc. that defines and even takes their fragile love forward. Apart from this love story, the plot revolves around the music of Maggiore Quartet-their trials and tribulations as well as the lives and relations of its musicians. Seth’s poignant writing is bound to take the reader on a lovely musical journey as grand as any classical concert itself. 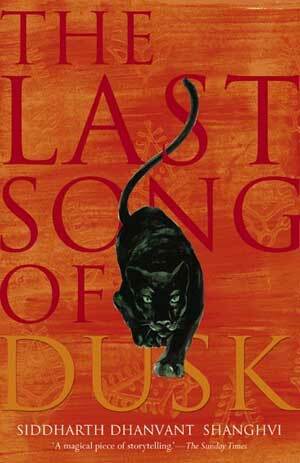 However such brilliant writing cannot hide away the predictability of the story at the start. This can be forgiven because of the utter sensitivity,hope,loss and fragmentation that shines through which is not exactly unique but can hardly be called cliched either. The plot in general tends to peter out and become too self indulgent. and tends to revolve around Michael alone for a large part of the story. This snatches from the novel the accolade of being completely perfect. Another negative aspect is the overuse of music jargon. Seth definitely has a wholesome knowledge of music but throwing a barrage of musical terms on an ignorant reader(like me) can sometimes take away the pleasure of enjoying the music depicted in words rather than increasing it. Other than that,the novel is pure magic and a divine concert of love. Ending on an exalted note that states the importance of letting love go sometimes, ‘An Equal Music‘ does what most love stories fail to do:end on a bittersweet note with Bach’s glorious music that lingers on even after the cover is closed. Perhaps this lingering memory can create an awareness of the potential and power of keeping love alive without having to constantly assert it and even create an everlasting love for beautiful classical music. I’ve learned what ‘classical’ means. It means something that sings and dances through sheer joy of existence. Perhaps like Holst, one may learn to appreciate its existence too.